The canvases are filled with palpable & allegorical narratives. The surfaces are rich with texture and filled with symbolic objects. The viewer looks over brick walls, climbs ladders, looks into mines, walks up wide seemingly littered steps, and is brought face-to-face with a volcano erupting with fiery hot lava. We are even struck by lightening — literally and figuratively. In each of the paintings, we are confronted, simply and most directly — with nature, and with ourselves. Arnold’s paintings are complex worlds woven and constructed in ways that lead us to grand conclusions. We are reminded of discovery of new excavations. We become the toiling worker resting from a weary day at the mines. We find solace in the journey and challenges of everyday travails. Edwige Fouvry’s show at the Dolby Chadwick Gallery San Francisco, CA. Edwige Fouvry’s work at Dolby Chadwick is present. When you see her paintings in person, there’s a softer clarity than one might perceive when looking at the digital images. The paint seems more “harmonious” in person. In either case, there’s a strong sense of personality– both hers and those of her subjects. Her line, the presence of her brush, has a quite open feeling to it. Yet her figures exist in seemingly tight or closed, almost suffocating space. I am particularly charmed by the little seascapes which have an immediacy to them. It is quite nice to meet her; she looks particularly lovely sporting a “madder lake deep”-colored scarf, an ever-present signature color in her figures. A Pilgrim’s Progress – Chester Arnold, Catharine Clark Gallery, SF, CA. Chester Arnold’s show presents panoramas of canyons, creeks, and chasms; journeys to countrysides, forests, and mines; and dialogs with bones, pails and hats. As you enter the gallery, the paintings strike you as contemporary work created by an “old-world” painter. The paintings take you to places you feel you might know, but know you have never been. Look beyond the rich, expertly rendered layers of paint and you’ll find, upon closer examination, familiar but unknown objects and memorabilia. The tools, the skeletons, and other magical things that are lodged into the crevices and the nooks and crannies of the majestic environments, revealing a hidden yet palpable unknown story (unless you’re fortunate enough to hear the stories told by the painter himself). 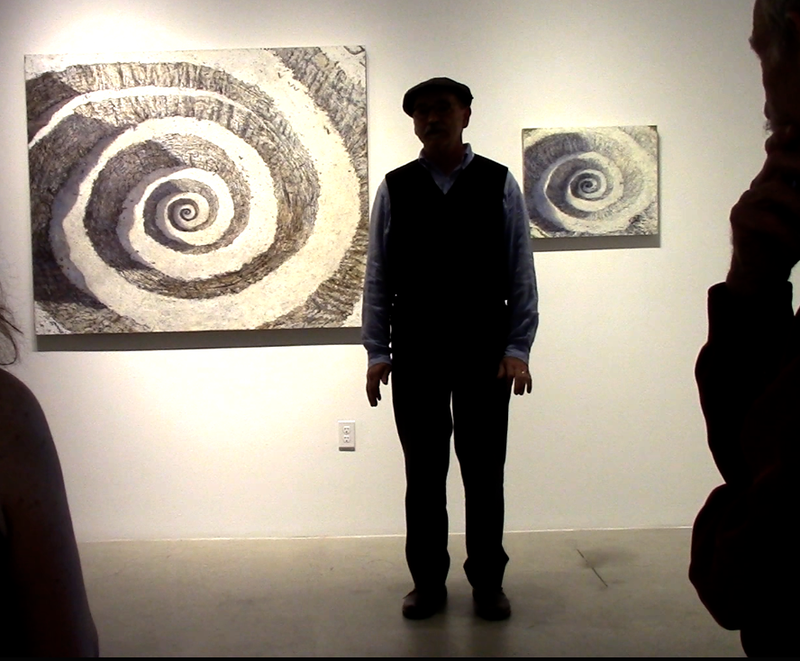 The show’s opening reception on November 3rd includes an artist’s “walk-through” and gives a lucky audience insight into his work, his paintings and his teachings– as a journey– which he fondly describes as the “disorganized religion of art.” (The show’s title comes from– and references– the Christian allegory by John Bunyan.) He explains that the work is idea-driven and reflects his childhood of “Sixty Years in the Forest.” Profoundly in love with painting at an early age, it is clear that this could not be more true for Arnold now. This show is one of discovered narrative. At first glance, you are presented with rich moody environments. Look closer and you’ll uncover and be taken-in by work which is cleverly embedded with humor, and with deep translucent light. The content is one of rich allegory and delicate spirit. Chester Arnold describes the work as “a physical objectification of detail… an inseparable union of interests” which he coins as a new genre of painting, “Psycho Realism.” Every paint stroke and every object reveals his love, his acute exploration, and his celebration of these worlds. If you’ve not yet seen the show, I encourage you to journey into these spaces and embark on the passage of time and experience through which these paintings might lead you.